John Hartford Stiltner, 62 years of age of Vansant VA, passed away Saturday, November 17, 2018 at his home surrounded by his family. Born April 7, 1956 in Grundy, VA, he was the son of the late Hartford Eugene and Florina Delphia Bowman Stiltner. John was of the Pentecostal faith and an avid outdoorsman and he loved deer hunting, camping, and riding his motorcycle. A loving father, grandfather, great-grandfather, brother and uncle. In addition to his parents, he was preceded in death by his first wife Sheila Stiltner. Survivors include his two sons, Thomas Stiltner of Haysi, VA and Jonathan Harry (Jessica) Stiltner of Hurricane, VA; four sisters, Phoebe (Kelver) Viers and Ceilia (Roy) Rice both of Vansant, VA, Goldie Rose Stiltner and Rosie (Russell) Scott both of Lebanon, VA; four brothers, William Henry “Bucky” (Sue) Stiltner of Raven, VA, Bernard (Cheryl) Stiltner of Jewell Ridge, VA, Marty Stiltner of Vansant, VA, and Lewis (Jennie) Stiltner of Oakwood, VA; one step brother, Henry Stiltner of Richlands, VA; a special uncle and aunt, Ferdie and Barbara Bowman of Honaker, VA; two step sisters, Billie (Farley) Sykes of Council, VA and Goldie Lewis of Lebanon, VA. He is also survived by his grandchildren, Jonathan Stiltner, JR, Briana Lynn Justus, Brent Stiltner, Mikey Owens, Hannah Cantrell and Jayde Stiltner; three great-grandchildren, Elijah Stiltner, Kaylee Justus, and Sierra Justus; and several nieces and nephews. Funeral service for John Hartford Stiltner will be held at the Shortridge-Ramey Funeral Home Chapel in Keen Mountain, VA, Wednesday, November 21, 2018 at 1:00 p.m. with Pastor Shawn Dotson and Pastor Brian Moore officiating. Burial will follow in the Stiltner Family Cemetery of Webbs Branch of Oakwood. The family will receive friends at the funeral home, Tuesday, November 20 after 6 p.m. where an evening service will be held at 7:00 pm. 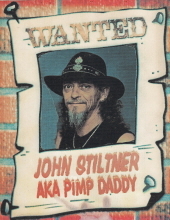 "Email Address" would like to share the life celebration of John Hartford Stiltner. Click on the "link" to go to share a favorite memory or leave a condolence message for the family.